During sports training, the body uses numerous nutrients and also loses a lot of fluid through sweating. For the perfect recovery after physical exercise, it is important to replace the lost substances as best as possible. Recovery drinks are an ideal choice for this. They supply the body with everything it needs for quick and sustainable recovery: from micronutrients to electrolytes. Our private label solutions for your recovery drinks strength or endurance consist of an effective dry mix that was specifically developed for supporting the body after an intense power or endurance workout. Moreover, our recovery drinks contain numerous ingredients with a very high nutritional density. 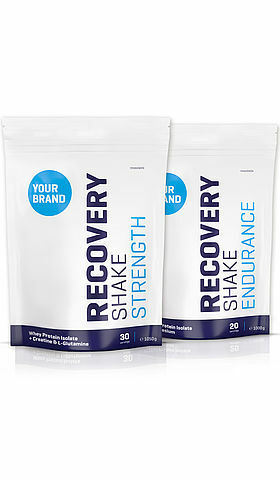 A serving of 35 grams of recovery strength gives back to the body everything that he has lost. A carbohydrate-protein mix ensures that the muscle glycogen stores are effectively replenished. The recovery drink strength by nutrineo provides valuable whey protein isolate, creatine and L-glutamine for a tailored regeneration after a strenuous strength training. In addition to dextrose, the innovative blend of Recovery Endurance contains whey protein isolate and key amino acids for muscle recovery. These help to balance lost salts through fluid loss. Enriched with vitamins and magnesium it supports regeneration after exercise. The contained protein promotes muscle maintenance and buildup while available carbohydrates quickly replenish energy stores. The contained vitamins C and B6 support a normal energy metabolism.